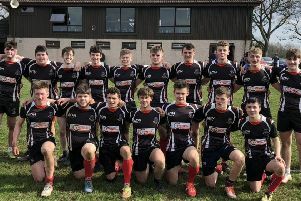 The St Leonards-Madras (SLM) Blues U18s welcomed Royal High from Edinburgh to Station Park at the weekend for a development match. The conditions were perfect for open expansive running rugby. Royal High had no answer to the pace, running lines, support play and offloading skills of the Blues. The SLM attack cut through the Royal High defensive line with stunning skills on a regular basis. Their defensive line knocked back every attack Royal High threw at them with brutal efficiency. The skills and commitment shown by the home team were outstanding and they came away comfortable winners in the development match. Ross McCrostie in particular was in free-scoring form. There were also tries for Mungo Somerville and Gregor Stirling (Tetrad), Angus Kennovin (Brace), Paul Murray, Alexander Samuel, Charlie Adams, Avi Nailatica, Edward Adamson, Scott Titterton, Hector Long and Ben Clark. Man of the match was Jack Christie.